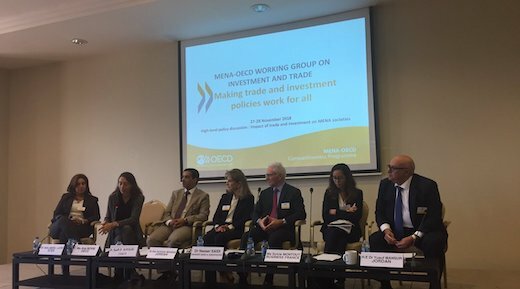 Dr. Nasser Saidi participated in the MENA-OECD Working Group on Investment and Trade meeting held over 27-28 Nov 2018 at Dead Sea, Jordan. Titled “Making trade and investment policies work for all”, the meeting’s first panel session discussed the state of play of investment and trade trends and reforms in the region in a changing world economy. It also took stock of the global debate on trade and investment, while analysing the impact on regional and national policies of the growing scepticism about the benefits of international economic co-operation, and looking at ways MENA countries and societies can better benefit from trade and investment. Click here to download Dr. Saidi’s presentation which focused on the findings of the policy paper prepared for the OECD titled “Trends in trade and investment policies in the MENA region“.